At first I had hoped to present the whole story of knitting in one volume only, but this eventually proved impossible, as the subject was too vast. So, with the greatest reluctance, a division had to be made, leaving the fascinating art of fabric construction, which rose to such heights of beauty in the brocade and lace periods of knitting, and which is now rapidly being multiplied, for a later book. This is already in preparation. The similarity in the names of the books is confusing; when I was buying my copies I spent some time trying to figure out whether they may not in fact be re-issues of the same book. Well, as Mrs. Thomas’s preface indicates, they’re two unique books, complementing and supplementing each other, even though they could be taken as complete works in their own right. Mary Thomas’s Knitting Book begins with the history of knitting, information on implements, yarn, gauge and tension, and continues with the foundational techniques – knitting, purling, casting on and off, etc. This is no mere instruction manual for beginner knitters though; Thomas delves into ‘knit movements’ and ‘selvedges’ with amazing detail, discussing, for instance, the English & Continental methods, in addition to several varities of ‘crossed’ and ‘uncrossed’ stitches (the ‘Eastern Uncrossed’ method is what is now often called ‘Combined Knitting’). There are then sections on increasing and decreasing, and several ornamental techniques. The last few chapters are on garment construction, shetland shawls, gloves, socks and stockings, and all are very thorough and enlightening. The second book, Mary Thomas’s Book of Knitting Patterns, deals with the creation of knitted fabric and surface ornamentation, and how it can be used effectively in design. Her short introductory chapter on ‘The A.B.C of Design’ should be essential reading for any ‘Beginning Knitwear Design’ course. 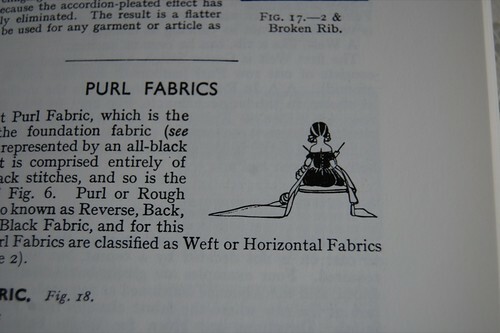 It’s worth noting that ‘Knitting Patterns’ aren’t, as we might assume, full instructions for creating a specific garment, but rather Thomas’s instructions for patterning the knitted fabric. In essence, most of the contents are ‘knitting stitches’ (or ‘stitch patterns’). Thomas’s practicality is almost unsurpassed. Both books have comprehensive indexes, and the second not only includes French and German knitting terms, but also has a ‘Texture Index’ which lists the stitches according to the projects they’re suitable for. What thoughtfulness! I think you’ll agree that Mary Thomas was ahead of her time. 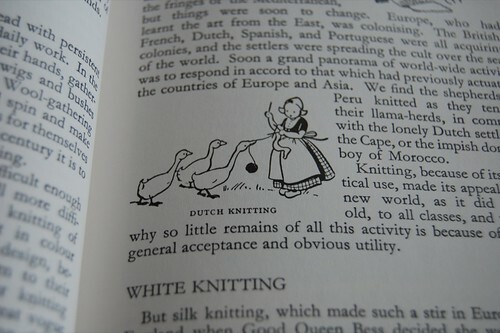 Even today few books are so comprehensive or enjoyable to read – ‘textbooks’ of knitting. She was also an early proponent of charting, though many of the symbols she uses won’t look especially familiar to knitters today. I couldn’t find any information on Mary Thomas on the internet, but the Ravelry Group mentions that Richard Rutt’s A History of Hand Knitting (UK) has a brief biography of her. As a knitter I probably shouldn’t admit this, but I love these two books almost as much for their darling little illustrations as I do for their content. They’re by Margaret Agutter, and each is based around a clever pictorial pun. I hope I’ve been able to clear up some of the confusions that might arise from the titles of these two seminal books, and have convinced you that they are worth reading cover to cover (first of all), and later referred to frequently. The Dover editions are still in print and aren’t too expensive, though I’ve noticed their prices have been going up! The Book of Knitting Patterns isn’t quite as cheap, but it’s still a bargain for all of the information it contains. But I bought the Knitting Book from Abebooks for… 64p! As I write this there are 2 copies going for 61p. Isn’t that the knitting bargain of the century? 4th September, 2009 // Knitwear Design, Literature // tags: famous knitters, Literature, mary thomas. You’ve certainly convinced me that I need to read these! her explanations are so thorough and enlightening! So often I have worked a ripple or old shale pattern without really knowing what was going on. When I read about bias patterns, a light bulb went off! These look fabulous! I’m off to have a look. Thanks for the tip. I was lucky enough to “accidently” inherit my Grandma’s copy of Mary Thomas’s “Knitting Book.” I had no idea she had it, and when they were going through her things as the household was divided after her death, someone (bless him/her) thought I might have some interest in it and set it aside for me: An original 1938 edition in pretty good shape. It’s the prize of my knitting library – and I agree – the drawings are especially dear. I think of Grandma who taught me to knit everytime my eyes see it. Thanks for reminding me to look inside again. synchronicity! I checked this out of the library this week — even though I own it (box #438 on the left) and was charmed and impressed again at how comprehensive her books are on the subject. I searched and searched and finally found attribution for the delightful drawings: Margaret Agutter. Yeah, Maggie! If you read the lace knitting sections you’ll be able to see where EZ got her inspiration for Pi shawl. I’ve had one of Mary Thomas’ books for years and have always wondered why EZ ended up being so much more popular. It’s time for MT to get the recognition she deserves in the modern knitting world! Thank you deeply for this coherent and concise description of Mary Thomas’ books! I’ve long wondered why some people love them so much but haven’t easily run across them. Now I’ll go out and order them. I am putting this site on my favorites list. I am looking forward to getting the newsletter. Your style is excellent: writing, placement and information. Thank you. It’s good to see Mary Thomas and her books getting the notice they deserve. When I bought my copies years ago I was simply adding to my how-to library. It was later that I came to appreciate the wealth of knowledge they contained. I have been knitting for over 40 years and had never heard of Mary Thomas. With also a love of books, I came across copies of both knitting books in a little cafe on the central coast of NSW, Australia, that had bric-a-brac and 2nd hand needlecraft items. Could not resist the purchase at $5 each. What gems! !